Maryam Maquillage: Can't Live Without My "Maryam"
ABOUT: Wow-imports specializes in Silver and Gold personalized name necklaces in many languages and scripts, including, but not limited to Hebrew, Russian, Armenian, Greek, Hindi, Urdu, Arabic, Farsi, Chinese, Korean, Japanese, and even Tibetan. The Latin alphabet necklaces (used in English, Spanish, French, etc.) are available in over 10 different fonts -- both classic and modern -- to cater to every taste and style. Wow Imports offers children's necklaces, personalized religious jewelry, Monogram necklaces and even Egyptian Cartouche pendants. With Wow Imports, you can personalize and customize any piece of jewelry: rings, bracelets, anklets, earrings and even cufflinks! THE MASTER: Eli Ron is a 40 year veteran jeweler and silversmith, who comes from generations of jewelers, many of whom were commissioned by royalty. 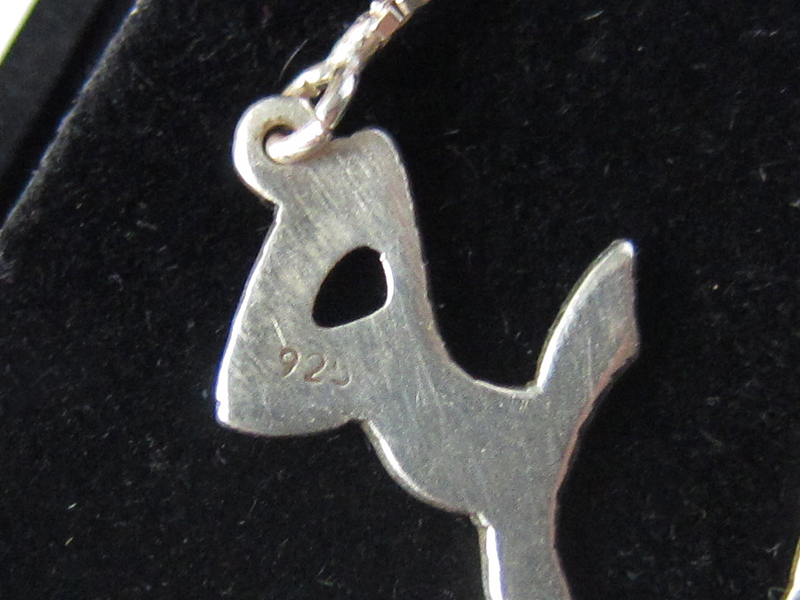 In fact, Eli's father, a local silversmith from Tunisia, is the likely founder of the name necklace which he first handcrafted in the 1950's in Jerusalem. 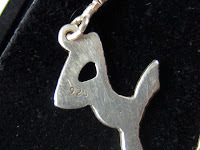 Many of the present makers of name jewelry apprenticed with Eli and a lot of the traditional name necklaces and name ring designs on the market today are his creations. It's more likely than not that you have seen someone wearing Eli's work! 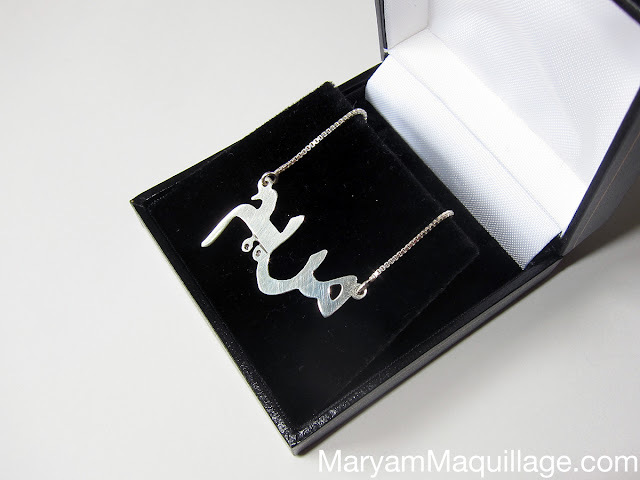 The "Maryam" Story: My Silver Arabic "Maryam" necklace is very near and dear to my heart. I first started wearing it about 2 years ago, after I saw a version of it in a photograph taken in Tunisia. 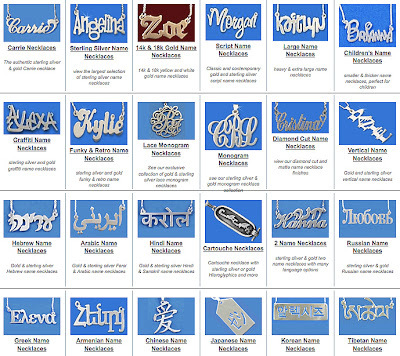 Since I wasn't in Tunisia at the time, I searched the net for authentic, quality Arabic name plate necklaces and stumbled upon Wow-Imports.com. I immediately placed an order and got my necklace about 3 weeks later. Since then, I've received countless praise and a ton of compliments on my necklace, and the positive energy from this handmade piece kept me warm and at peace. In a sense, this necklace has been my talisman and protector. Although I've had a "Maryam" necklace for a while, the one you see in these photos isn't my original piece. Sadly, I lost the name plate I ordered two years ago (ironically, it was a few days before I planned to feature it on my blog) and the one you see here is a replacement piece. Thankfully, the lovely people at Wow Imports were kind enough to send me a brand new "Maryam" necklace in exchange for this review -- and I couldn't be happier! Thanks Wow Imports! The calligraphic quality of the Arabic writing is so beautiful and timeless; I couldn't help but create a makeup look inspired by it. 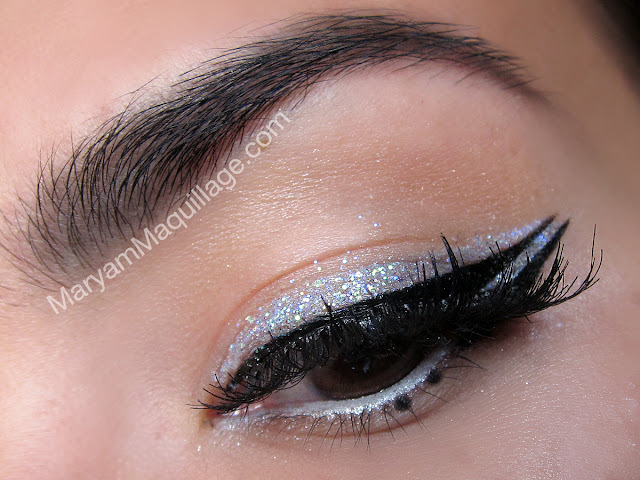 For the eye makeup, I chose a simple, double winged graphic liner and silver glitter and emphasized the look with two dots, as expressed in the Arabic writing of the name "Maryam". I Can't Live Without My "Maryam"!!! Visit Wow-Imports.com for Silver & Gold name jewelry and much more! Wow this is beautiful! I been looking for something where I can incorporate my name without it just being flat out English alphabet letters I'm super happy I came across this!! Very beautiful necklace and I also like the makeup you created! love this! you are a true cosmo girl ... aaaawww your lips!!! arabic writing just flows... I love it!!! You are so pretty my gosh & that look is gorgeous! So glad I saw this post, my friend has been wanting a necklace like that for a few years now. Gorgeous makeup babe!! LOVE the necklace, so chic! This necklace is gorgeous and so are you, love the makeup Maryam!!! I want one in gold too!!! well, we know where to get one hehe :)) thanks love!! well HELLO GORGEOUS!!! love the eyes!!! Your make-up look is sooo pretty, oh my god, wooow!! <3 *w* You are so talented! Your makeup!!!! Woww!!!! I love it!! And what a gorgeous necklace!! 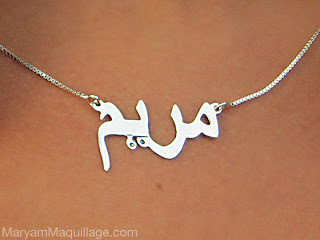 I have a similar necklace with my name on it, made in Morocco, but I don't know where I put it! I'm going to search for it. Seeing you wearing this necklace, makes me want mine back too! A few times earlier you mentioned on your blog that you are Russian, but your name and your sister's name are Arabic. And you don't look Russian either! Are you Russian or a mix? :) Sorry for my curiosity! Really loe name necklaces ..need to get my hands on a gold one ..
btw I awarded you with "the versatile blog award." <3 And posted some of your photos on it to promote your blog! Oh! Hot! Hot! Hot! Stunning look! I simply love your makeup!!! I absolutely love it, so simple yet gorgeous and goes so well with everything! me encanta el maquillaje y viendo tu blog, tienes buena mano para ello. That's a beautiful piece of jewelry with an equally beautiful story behind it. So cool! Gorgeous piece! Love the silver liner ... It is so pretty! Absolutely lovely! I have a ver personal connection to the arabic culture and language so I'm definately going to have to snag one of these beauties. LOVE the glitter-- you are the master of all liner I PROMISE! Those are a really lovely idea! Gorgeous job on the makeup look, I really love the eyeliner and lip colour! I looooove the necklace. I've actually been looking for a name necklace for a long time and Wow-imports seems the perfect place to look. I love the necklace&i love ur makeup honey, flawless as always ..! Wow Maryam! You look incredibly sensational, stunning,saucy and ravishing in the simple,silvery and exquisite necklace adorning your pretty neck. You are the Amazing Alluring Astonishing Asian Aphrodite - the goddess of love, beauty and sexual rapture.You are indeed Maryam the Magnificent ! Love the liner! I would probably change the shape a little, but I love the glossy black and the glitter! So pretty! MA SHA ALLAH!....nice name and make up.....my name is also Mariam but i also respect my name...call me conservative but i really don't mind it....i won't like to wear a necklace of my name if i wanna show my cleavage....because for me it would like making a fun of this name because Mariam was the mother of our prophet Isa, who was virgin at the time of Isa(AS)'s birth and such a pious lady that ALLAH mentioned the chapter of her name in Qur'an.